From the outset, SSF has been designed to respond flexibly and rapidly to needs on the ground, to experiment and incur higher levels of programming risk than is normal, and to adapt in response to learning. 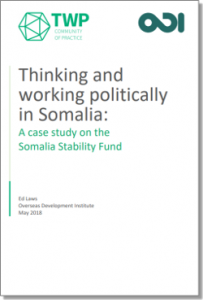 SSF’s strategy is also problem-driven: rather than providing a detailed description of a desired end state and a sequence of actions to deliver it, it identifies a core problem at the root of instability in Somalia and decides how to address it. Its aim is to generate a sequence of iterative solutions, and to keep adapting and improving. SSF is intended as a flexible programme, able to react quickly to opportunities as they emerge and change course in response to an evolving and dynamic context. The Fund is also driven by the principle of ‘local ownership first’, based on the belief that for peace to be sustained, it must be home grown, bottom-up and context-specific. These principles and features of the program resonate strongly with some core ideas and examples being discussed about how to do more effective development practice through more politically informed and adaptive ways of working. It is clear that SSF has achieved some significant successes in an extremely challenging and dynamic political environment, which does suggest the value of thinking and working politically in this context. This report looks at three success cases: the Fund’s support to the formation of three nascent federal states; infrastructure investment projects in Balanbale and Abudwak; and the reconciliation process between Galmadug State and Ahlu Sunna Waljama’a. This is followed by a discussion of two of the more challenging investment projects that the Fund has engaged in, focusing on the Hirshabelle State Formation process and the construction of the Baraawe airstrip. The report then looks at the Fund’s work on gender equality, reflecting on its progress in achieving greater formal political representation for women in Somalia, but also some of the significant obstacles that remain in shifting entrenched patriarchal norms. A diverse portfolio of investments and a sophisticated approach to balancing more political, potentially higher risk projects, with less political, often lower risk ones. This report also details some of the ways in which the Fund’s systems and processes are not being used in ways that support thinking and working politically. For example, the programme’s monitoring, evaluation and learning tools have not always been used in ways that capture the value of the less formal political analysis, negotiation and networking that is critical to the Fund’s work. And whilst SSF has impressive analytical capability and a deep contextual understanding of political dynamics on the ground, there are challenges with verifying data and information when working in fragile and conflict-affected states. These challenges are not unique to SSF, and point to some wider issues that may require attention from researchers and practitioners if the thinking and working politically agenda is to make a real contribution to improving aid delivery in fragile states.